New York Times bestselling author John Hagee presents political, cultural, and personal challenges in this riveting examination of global issues that threaten America. As an outspoken, conservative Christian leader, Pastor John Hagee heats up the debate about the intersection of American politics, Iran’s evil intent, Israel’s heritage, the Mayan Prophecy for 2012, and the end of the world. 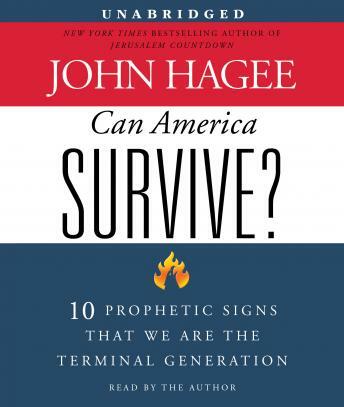 With chapter titles like “Iran’s Nukes Are Ready Now!,” “The Day after the Bomb,” “The Criminalization of Christianity,” and “Calling All Czars,” Pastor Hagee courageously calls the American nation and citizens to task. Carefully documented facts and powerful biblical teachings are the basis for the provocative claims and predictions outlined in this riveting book. A personal friend of Israel’s Prime Minister Netanyahu, Hagee shares a frightening conversation he had with Netanyahu regarding the coalition of Russia and Iran in their nuclear efforts. Then in graphic detail Hagee describes the coming war in the Middle East, with Russia leading a massive Islamic army against Israel. While respectful of President Obama’s office, Hagee examines the administration’s implementation of Czars and the coming of a global Czar whom the Bible calls the Antichrist. Can America Survive? concludes with a spellbinding description of Armageddon—the Mother of All Battles—and the ultimate return of the Messiah, which will bring peace on earth and leave Jerusalem as the epicenter of planet earth.